Often in dune areas, at edges of forests and in grassy openings, and in other sandy ± open sites; rock crevices and forest borders at Lake Superior; shores, thickets, and mixed forests. Several mixed and simultaneous collections of this species and H. kalmii indicate that the two frequently grow together. American plants of this species have sometimes been segregated as H. scabriusculum Schwein. The inflorescence of both this species and H. kalmii is often umbelliform, although the heads may also be in an elongate panicle, as in H. scabrum. The characteristic dense little cone-shaped projections along the leaf margins are generally ca. 0.2–0.3 mm long. MICHIGAN FLORA ONLINE. A. A. Reznicek, E. G. Voss, & B. S. Walters. February 2011. University of Michigan. Web. 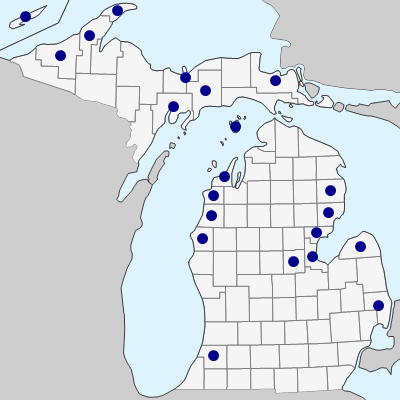 April 20, 2019. https://michiganflora.net/species.aspx?id=376.